Keeping in mind this definition we could say that all jobs require more or less the same set of soft skills. Yet, software developers usually work individually and only periodically communicate about the work with their colleagues in order to synchronize the various project elements. This characteristic of the software developer job presumes a small deviation in the soft skills set one must have. Perhaps this is also the reason why software developers are thought to be introverts and non-communicative, although that is mostly a myth. Programming is an activity done in one’s mind so it is highly important for a software developer to be self-motivated. In case you are working in an office and are a part of a team some of the motivation will come from there, but most of it should come from within. But if you are self-employed then all of the self-motivation depends on you and so does the quality and quantity of the work you do. Beginner software developers often imagine doing the job entirely by themselves but the reality differs. Most of the software developer jobs depend on the ability of the team to work together as a well-oiled machine. Contrary to the vision of the outsider this is even more important if you are self-employed because in reality you are a part of the team of your contractor and his interests, goals and desires should become yours. All of us constantly have to learn and acquire new skills, especially in the fast-pace reality of the technology world. This inevitably means that every once in a while we are bound to do mistakes. A responsible software developer would be able to take responsibility for his/her mistakes. Another obligation that comes with the job is renewing one’s knowledge and skills so that he or she could offer the best solution to the programming problem. Speaking about problem solving we can’t omit this soft skill. 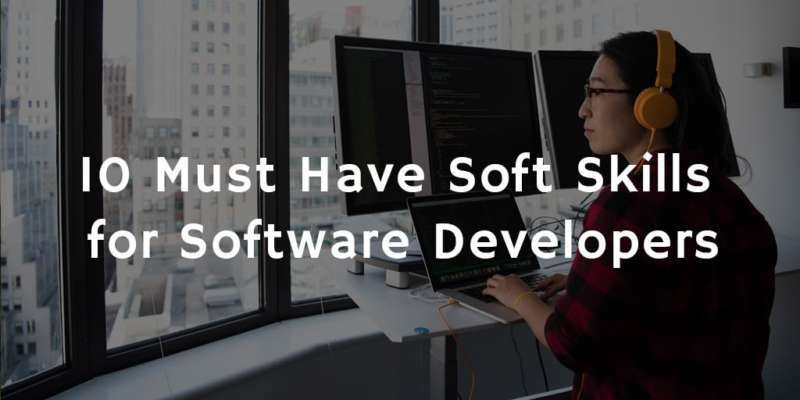 Software developers are problem solvers in their core and it is highly unlikely that you have chosen such a profession if you don’t have the desire and skills to do that. In today’s consumer society everything comes down to good time management. It’s all about deadlines! Thus software developers should be good at scheduling their time properly and managing it strictly. Sure, there are the cases of those who seem to always manage to finish their job last minute, after some procrastination, but we wouldn’t count on it. With deadlines come stress and pressure. Often those who set the deadlines do so in order to shine in front of their employers, instead of helping the software developers. Pressure in that line of work also comes from the fear of making a mistake or the lack of experience. A good software developer must be able to annihilate the pressure, embrace it or have some great hobbies to relax after a stressful day of work. Sure enough every project develops with time and is highly likely to undergo some changes. Not to mention (again) the fast-pieced reality of the technology world. All that means that the constant learning should go hand in hand with some flexibility. A good software developer would never snap to a younger colleague for showing him/her a newer, faster, easier way of coding. Imagination and creativity could make the difference between being a mediocre software developer and being a genius one. Unfortunately, as in many professions, in the field of technology by the time you get the opportunity to show your creativity, you may be too tired to do so. Remember to never give up on your imagination and creativity! Every project and team need a leader be that a official or unofficial one. Bigger projects and companies employ Software Developer Manager, who has the appropriate studies and credentials and/or lots of experience. Even universities felt the need to offer such degrees. This isn’t a skill any software developer must have, but in case you are one of those aspiring for managerial positions we advise you to attend some courses. According to many psychologist we all play roles in our lives – the role of someone’s child, husband, colleague, friend, parent, etc. Actually, this is what keeps us sane and grounded. It is very important to know when to switch the role and change your behavior. It is unhealthy to be the professional at home with your infant and partner, or the loving parent at work. Make sure you enter and exit your software developer role whenever needed.